The 2016 Paris Motor Show kicked off this week and has brought a load of exciting car announcements with it, including an incredible Renault concept car, the highly anticipated Ferrari LaFerrari convertible, and an awesome Audi RS 3 saloon! The roofless equivalent of Ferrari's LaFerrari has been unveiled at the Paris Motor Show. Back in July the open-top LaFerrari was confirmed by Ferrari alongside some great renders of the car, however its name wasn't and neither was an actual photo of the it. 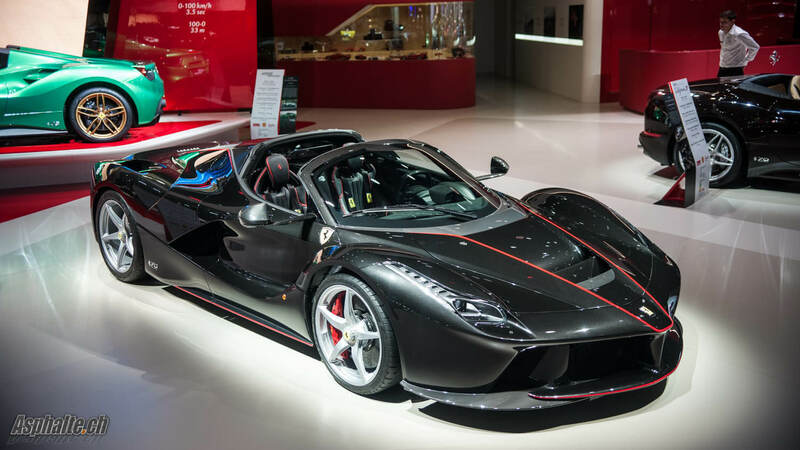 Now however, we have both, as Ferrari have shown it off at the Paris Motor Show with the official name of Aperta. It features the same 950 bhp 6.3-litre V12 engine as the coupe, and delivers a 0-62 mph time of under three seconds. A great feature about the Aperta is that you have the choice of two roof options: a temporary fabric roof and a carbon fibre hard top. It also comes with a love of active aerodynamics including an active rear spoiler, plus flexible front and rear diffuser. Only 150 Apertas will be made which is significantly less than the 499 coupes that were available. Ferrari didn't reveal the price of each model either, however it's rumoured to be around £2.5 million. We'd better get saving! This is a car that will surely wow you: the Renault Trezor concept. The Trezor is a rather unique GT concept car to say the least. With its carbon fibre body made up of futuristic panels, sharp lines and aggressive curves, the car really is a thing of beauty - not to mention that insane roof. It's powered by an all-electric drivetrain that was derived from Renault's e.dams Formula E racing car, giving it 345 bhp and an impressive 0-62 mph time of less than four seconds. Whilst the Trezor isn't going to be anything more than a concept car, it does represent the new direction that Renault are looking to take. The brand was in need of a revamp after growing stale the past few years, and with design boss Laurens van den Ackar at the helm, it looks as though that's going to becoem a reality. We'll see how much of this revamp is applied to their new wave of cars though, starting with their Clio in 2018. The 70th anniversary of Ferrari is being celebrated with the launch of 70 special liveries. Each of the 70 liveries are inspired by cars from Ferrari's history, with four examples from the collection appearing at the Paris Motor Show. The first is a 488 GTB finished in red and white, paying homage to the most successful Grand Prix driver ever: Michael Schumacher. Next up is a dark blue F12 Berlinetta with a white stripe and door roundels, honouring Stirling Moss' 250 GT Berlinetta. The third is perhaps the most subtle, a brown California T with tan leather interior, which is a tribute to driver Steve McQueen's 250 GT Lusso. Then on the opposite end of the scale, a real vibrant green 488 Spider with circular door number decals, gold wheels and white side skirt strips that's inspired by David Piper's 365 P2. In total Ferrari made 350 cars for the occasion - 70 liveries for five different models - all of which have already sold out. The RS 3 Sportback is set to be joined an saloon-shaped brother. With the A3 and S3 available in saloon form, and no RS 4 saloon currently on offer, you always kind of expected Audi to launch an RS 3 saloon, but now we have official confirmation of it. As you can see, the car is very much the S3 saloon but with some RS 3 Sportback bits, such as the front bumper, rear diffuser, chunky wheel arches and trademark twin oval exhaust pipes. Under the bonnet is the same 2.5-litre turbo five-cylinder engine that's present in the RS 3 Sportback, however it's been bumped up 33 bhp to bring it to an incredible 394 bhp. That near-400 bhp power gives it a 0-62 mph time of just 4.1 seconds and a top speed of 174 mph. 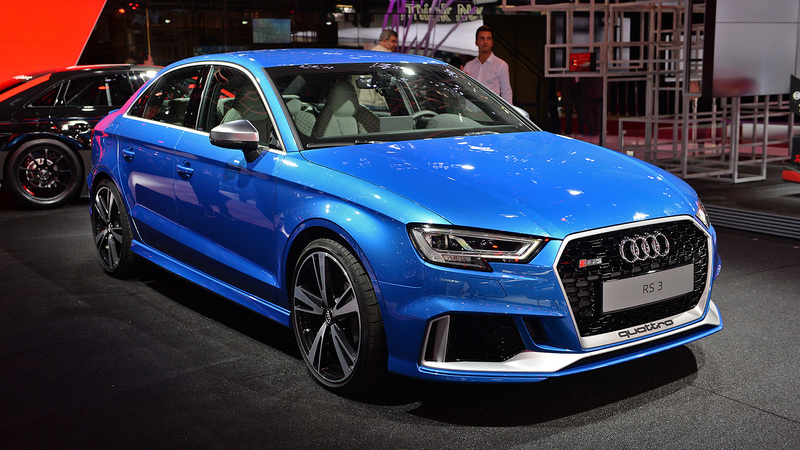 The RS 3 saloon is expected to arrive in the UK in late 2017 at a cost of around £43,000. Here's the first taste of a potential new model to join the BMW lineup: the X2 concept. As you'd expect, the X2 concept follows the same coupe-like shape as its X4 and X6 older brothers, but with the smaller size of a car that sits between the X1 and X3. In typical concept fashion however, the X2 boasts a very futuristic, sharp and and low-slung look, suggesting a potential direction that BMW may take with their future models. Although this X2 is a concept model, the production version is on the way and will be arriving at some point in 2018. There's no images of it as of yet, but you can imagine it'll look somewhat similar to the concept but with smaller wheels, a more subtle look and the usual grille, lights and wing mirrors you can expect from a current generation BMW.